Lee, G. (2012). Guns and violent crime. In The social history of crime and punishment in America. [Online]. Thousand Oaks: Sage Publications. Available from: https://search.credoreference.com/content/topic/firearms_and_crime [Accessed 25 April 2019]. Lee, Gavin. "Guns and Violent Crime." The Social History of Crime and Punishment in America, Sage Publications, 1st edition, 2012. Credo Reference, https://search.credoreference.com/content/topic/firearms_and_crime. Accessed 25 Apr. 2019. Violent crime around the world has remained remarkably constant over both place and time. The United States has often been the location of gun violence studies because of the relatively high prevalence and availability of firearms. Much of this research, however, has been criticized for potentially being designed to make an ideological point as opposed to providing an accurate picture of the extent and nature of gun violence. Furthermore, the extant research has oft-times been misused in the gun debate to support the positions of either the pro-gun or anti-gun lobbies. There are approximately two million firearms in the United States. Every day in the United States, guns claim 84 lives and wound nearly 200, resulting in more than 30,000 people dead and over 70,000 wounded by firearms each year. Gun violence in the United States has been estimated to cost over $20 billion per year; between 50 and 80 percent of the cost is borne by taxpayers. Research on gun violence shows that the greater the density of guns in a population, the greater the level of gun injury and gun death, other things being equal. Gun crimes have been increasing as a percentage of all violent crime; however, throughout the 1990s, the number of homicides decreased by 36 percent and the numbers of murders by guns decreased by 41 percent. Over this time, the revolver has fallen out of use in favor of semiautomatic pistols that have a greater number of bullets that can be fired before reloading is necessary. Such pistols can have 20 or more rounds in their removable magazines. Semiautomatic pistols also tend to have larger caliber bullets, which, in turn, increase the potential for more serious injury in a shooting incident. In California, sales of guns to people with at least one prior misdemeanor conviction were six times more likely to be followed by a violent offense than sales of guns to people with no prior criminal history. Even removing these purchases by criminals, however, the United States would still have the highest rate of gun violence of all advanced countries because the majority of gun-using criminals have no prior convictions. Gun violence is not evenly spread throughout American society, with gun violence geographically concentrated in the areas of greatest inequality in the nation—the poverty-stricken areas of inner cities. Half of all homicides occur in the 63 largest cities, which contain only 16 percent of the population. Most of those homicides are committed with handguns. Gun violence experienced a downward trend during the 1990s as the rate of other crimes also dropped. During this time, gun crimes declined more rapidly than other crimes. Firearm violence decreased by 63 percent between 1993 and 2001. Those 12–14 years old experienced a 97 percent decline in firearms violence. In general, minority males (primarily blacks and Hispanics) aged between 15 and 24, and those with the lowest household income are the most vulnerable to being the victims of gun crime. Blacks are nine times more likely to be victims of a firearms-related homicide than whites. Blacks represent 54 percent of the victims of firearm homicide in the United States, while only making up 12 percent of the population. Firearm homicide is the leading cause of death for black men ages 15–34 and is the leading cause of death for all African Americans aged 15–24. The rate of violent firearm victimization for blacks and Hispanics is approximately twice the rate for whites. For both black and Hispanic victims, the greatest rate of victimization was found in the 18–20 years old category. Both whites and blacks aged between 18 and 20 were more likely than whites and blacks of other ages to have been the victims of firearm violence. For blacks, whites, and Hispanics, the victims of gun violence have an average age that is lower than that of the general population. Among all victims, blacks are older than Hispanics at the time of victimization. American Indians have a 43 percent higher victimization rate than blacks, 78 percent higher than Hispanics, and 184 percent higher than whites. Males are more likely to be victims of gun crime (about one-third of all violent crimes), whereas females are victims in about one-fifth of crimes. These guns were taken from gang members by the U. S. Marshals Service and the San Antonio, Texas, police department in August 2011 as part of a larger operation that led to 212 gang member arrests and the seizure of 38 weapons. The Kansas City Gun Experiment in 1992 found that a 65 percent increase in gun seizures by the police resulted in a 49 percent reduction in crimes committed with guns. The effect of household income (which may suffer from a degree of colinearity with race) is also a factor in victimization rates. Individuals who have a household income of less than $7,500 experience gun violence at a rate three times higher than those with a household income of over $50,000. Blacks at all income levels are more likely to be victimized than whites; but, both blacks and whites are more likely to be victimized in the "less than $7,500" group than those in the "more than $50,000" group. Crimes committed with guns are 3.5 times more likely to cause serious injury or death than crimes committed by an unarmed assailant. Roughly 16,272 murders were committed in the United States during 2008. Of these, about 10,886, or 67 percent, were committed with firearms. Based on survey data from the U.S. Department of Justice, roughly 5,340,000 violent crimes were committed in the United States during 2008. These included simple/aggravated assaults, robberies, sexual assaults, rapes, and murders. Of these, about 436,000, or 8 percent, were committed by offenders visibly armed with a gun. The time of the crime seems to influence the probability of a gun being used in a violent incident. Three out of every five violent gun crimes are committed at night. Over 25 percent of all gun crime victimization occurs when the victim is traveling either to or from work. The most common location for gun violence is on the street, which accounts for 30 percent of all gun crime. Victims were confronted with a firearm by strangers at a rate three times higher than by an intimate partner. A 1993 nationwide survey of 4,977 households found that, over the previous five years, at least 3.5 percent of households had members who had used a gun for self-protection or for the protection of property at home, work, or elsewhere. This amounts to 1,029,615 such incidents per year. A 1994 survey conducted by the U.S. Centers for Disease Control and Prevention found that Americans use guns to frighten away intruders who are breaking into their homes about 498,000 times per year. Further to this positive picture of defensive gun use, a 1982 survey of male felons found that over 34 percent had been scared off, shot at, wounded, or captured by an armed victim; 40 percent had decided not to commit a crime because they knew or believed that the victim was carrying a gun, and 69 percent personally knew other criminals who had been scared off, shot at, wounded, or captured by an armed victim. One study showed that when an offender has a gun, the probability that a threatening situation will result in a homicide is 176 in 10,000 incidents. This is five times higher than the overall risk of 36 homicides in 10,000 threatening situations. Other studies, however, have shown that a threatening situation is less likely to lead to a physical attack when the offender has a gun. Also, when a threatening situation does escalate to an attack, there is a lower probability that the victim will sustain an injury if the offender used a firearm. At first, this seems a risk reduction; but it must be borne in mind that there is a much higher probability that any injury will be fatal when a firearm is involved. President Bill Clinton signed the Brady Handgun Violence Protection Act into law in 1993, also known as the Brady Bill. The enactment of the Brady law required that every gun sale be subject to a background check carried out by law enforcement. So far, this law has successfully blocked nearly two million attempts by dangerous people to purchase a gun. After the passing of the Brady Act in 1993 and the Assault Weapons Ban in 1994, the United States saw a reduction in both gun crime and gun violence. From 1993 to 2003, gun homicides dropped by 37 percent and other gun crimes dropped by 73 percent. The 1994 Assault Weapons Ban led to requests for Alcohol, Tobacco, and Firearms (ATF) traces of the banned assault weapons. Their use in crime dropped by 20 percent in the first year, steeper than the 10 percent drop in all homicides. Gun murders also dropped 11 percent below projected levels in the 38 states that had not previously passed a similar ban. Gun murders did not drop in the states where such weapons were already banned. Further, there was a reduction in the rate at which police were murdered with firearms. Subsequently, the administration of President George W. Bush allowed the assault weapons ban to expire, despite opposition from many law enforcement agencies at the local, state, and federal levels. In addition, the Bush administration, via federal legislation, gave the gun industry protection from liability lawsuits. This resulted in an increase in gun crime and gun homicide. The first formal test of uniformed police patrols against guns was the Kansas City Gun Experiment in 1992. Police in a high-crime area worked overtime to increase gun seizures by 65 percent, and found a 49 percent reduction in crimes committed with guns. This study found no change in either gun seizures or gun crimes in a similar area several miles away. A modified replication of the Kansas City study was carried out in 1996 in Indianapolis. Two target areas either maintained or increased the level of gun seizures, while gun seizures dropped in a comparison area by 40 percent. According to one evaluation, gun assaults, armed robberies, and homicides dropped by 50 percent in one area and 25 percent in the other area, even though crimes rose 22 percent in the control area. Boston's Operation Ceasefire carried out in 1996 and 1997 was part of a collaborative, comprehensive strategy to address Boston's escalating rates of violent crime. 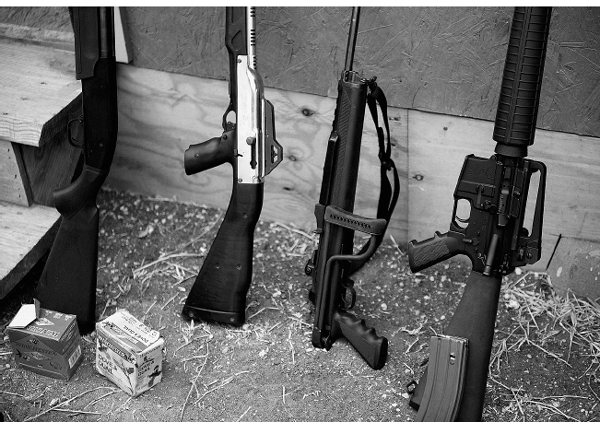 It was a citywide operation that used state and federal laws to crack down on gun crime. The program was a focused law enforcement response to illegal gun traffic in Boston to limit the availability of guns, thereby preventing further homicides and injuries. Homicides in Boston decreased after the program's inception. To determine if the program was associated with this decline, researchers carried out an evaluation of the program's effects on gun violence in the city. They found that the interventions resulted in a 63 percent decrease in youth homicides per month, a 25 percent decrease in gun assaults per month, and a 44 percent decrease in the number of youth gun assaults per month. All of these were in the district in Boston with the highest crime rate. Operation Ceasefire Los Angeles was based on Boston's program. The Los Angeles model was used in an area that had a high level of gun violence. The intervention used intensive law enforcement activity to deter gun crime and offered gun and gang prevention services. The operation also sent a strong message that all gang members would be held accountable if any one of them engaged in violence. The results of this program were inconclusive. In 1999, Florida (followed by several other states) enacted the 10–20-Life law, which was accompanied by the public service announcement slogan "Use a gun, and you're done." This law ensured a mandatory minimum sentence of 10 years for brandishing a gun during certain felonies, a 20-year mandatory minimum for firing a gun during the commission of certain felonies, and a sentence of 25 to life for shooting someone during the commission of certain felonies. Between 1998 and 2004, Florida's violent gun crime rate dropped by 30 percent, a finding that authorities held up as a vindication of the tough-on-crime legislation. The Supreme Court has also been involved in the gun control issue. In District of Columbia v. Heller (2008), the court addressed the central meaning of the Second Amendment and its relation to gun control laws. After the District of Columbia passed legislation requiring licenses for all pistols, and that all legal firearms must be kept unloaded or trigger locked, a group of private gun owners brought suit, claiming the laws violated their Second Amendment right to bear arms. In a 5–4 decision, the court held that the Second Amendment protects an individual's right to possess a firearm unconnected with service in a militia, and to use that firearm for traditionally lawful purposes, such as self-defense within the home. Writing for the majority, Antonin Scalia addressed the problem of gun violence in the United States in ruling against the District of Columbia statute. He stated, "We are aware of the problem of handgun violence in this country, and we take seriously the concerns raised by the many … who believe that prohibition of handgun ownership is a solution. Undoubtedly some think that the Second Amendment is outmoded in a society. where gun violence is a serious problem. That is perhaps debatable, but what is not debatable is that it is not the role of this Court to pronounce the Second Amendment extinct." There is a link between guns and violent crime in the United States; however, the nature of that link and its magnitude is still a matter of considerable debate. In a country where the right to bear arms is such an embedded part of its culture, any drastic reform remains unlikely. This will continue to be an issue with which both policy makers and the public must wrestle for the foreseeable future. See Also: Bureau of Alcohol, Tobacco, Firearms and Explosives; Crime in America, Causes; Federal Bureau of Investigation; Gun Control; Violent Crimes. Cook, Phillip and Ludwig, Jens. Gun Violence: The Real Cost. New York: Oxford University Press, 2000. Lott, John. More Guns, Less Crime. Chicago: University of Chicago Press, 2010. Zimring, Franklin and Hawkins, Gordon. Crime Is Not the Problem: Lethal Violence in America. New York: Oxford University Press, 2008. Laura Browder, author of Her Best Shot: Women and Guns in America, notes that it is difficult to know how many women own guns and for what reasons.